While we usually think of neuro-musculoskeletal structures for painful conditions there are clearly other factors that play a role. For example, with claudication calf or leg pain is due to Peripheral Arterial Disease (hardening of the arteries). Deep venous thrombosis (DVT) can also cause leg pain, but is due to blood clots in the veins ratherthen a neuro-musculoskeletal structure. 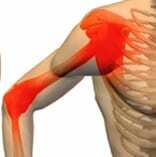 Thoracic Outlet Syndrome occurs as a result of compression of the Subclavian artery or vein as they pass from the neck into the arm. It presents with complaints of arm pain, weakness and numbness, especially in the small and ring fingers. Several other painful conditions, such as Reflex Sympathetic Dystrophy (RSD), Peripheral Neuropathy and Fibromyalgia are thought to have a vascular component. 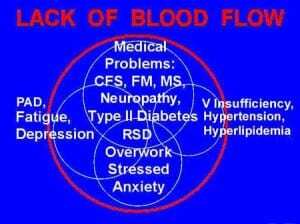 In addition, some people have a genetic predisposition for coagulopathy (a clotting disorder). While most are not symptomatic, once a chronic disease occurs even those with mild abnormalities may have a harder time recovering. People with chronic pain may have fibrin deposition (early clot like areas) trying to protect small areas of cell walls that have their insides exposed due to injury or infection. These deposits of fibrin reduce blood flow to the area and reduce local oxygen availability (figures adapted from Hemex.com). Chronic venous insufficiency, which typically affects the legs, can cause calf and ankle swelling, skin discoloration and chronic pain. While venous insufficiency is most often attributed to incompetent (bad) valves, it too can arise from persistent micro-fibrin clots that lead to back sludging of the blood within the venous system. 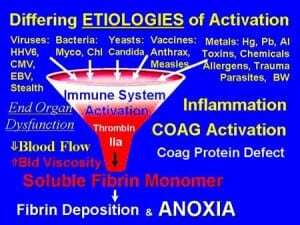 It stands to reason that if we can increase the amount of oxygen in these disorders by enhancing the amount of available blood from within the arteries, or the return of “used” blood from within the veins, then chronic pain associated with a lack of oxygen is more likely to resolve. One method to accomplish this is the use of thrombolytic therapy with the intent of eradicating micro emboli or thrombotic clots. Heparin and Coumadin are commonly used “blood thinners” that resolve and prevent the reoccurrence of venous blood clots. Heparin is more frequently administered in the hospital and Coumadin as an outpatient. Both require careful monitoring in order to prevent excessive blood thinning and to avoid predisposing someone to excessive bleeding. Newer, low-molecular-weight, “Heparin like” pharmaceuticals are now available that require less monitoring and have high safety profiles. As a result, they can be administered as an outpatient and for prolonged periods of time. Naturally, this treatment approach can only be done under the direction of a physician. 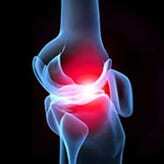 It is helpful if the doctor is familiar with both vascular and neuro-musculoskeletal medicine. Patients who are more obvious candidates include those who complain of limb swelling and have visible signs of rubor (bluish discoloration of the skin) or have either a personal or family history of an excessive clotting disorder. They must also either be able to self administer, or have access to someone else who can administer subcutaneous injections on a daily basis. Treatments are initially given for one month; however, depending on circumstances, they may be started for shorter periods or continued beyond a month. Prior to commencing therapy, laboratories including CBC, PT, PTT’s, blood viscosity, and fibrinogen levels should be considered. While the incidence of unintended bleeds is uncommon in outpatients receiving low-molecular-weight heparin compounds, patients should be cautioned about the concomitant use of aspirin or other anti-platelet products. Some patients have also found the use of natural enzyme products such as Lumbrokinase/Bolouke (canadarna.com) to be quite helpful. These are non-prescription items, but should be used with caution as they can alter blood chemistries and have drug interaction with other vascular medications. We have had excellent results with Bolouke in the treatment of venous related disorders including reflux, insufficiency and mild coagulopathies. To maximize safety, always tell your physician if you choose to take one of these enzymes. Contact our office wellness coordinator for assistance in obtaining Lumbrokinase (Bolouke). With proper supervision and indications, thrombolytic therapy can be used successfully to treat painful vascular and neuro-musculoskeletal conditions.